These new Fall pieces from L.L. BEAN SIGNATURE make me want to go live in a cabin in the woods. A really nice cabin. Substantial alpaca/wool blend with ribbing at the cuffs, hem and neck. Slightly fitted. Straight hem falls at the hip.70% Alpaca / 30% Wool. We used fine virgin wool to make this graceful, bias-cut skirt that falls to an A-line silhouette. Sits at the waist and zips on the side. Fully lined. Measures 40″ from waist to hem. 100% Italian wool. Full-grain leather upper with a padded soft leather lining for additional comfort and support. Molded heel with stacked leather wrap and leather outsole with embossed Signature logo. A striking new look for our famous Bean boot bottom. This 14-eyelet lace-up boot is fully lined – shaft and sole – with shearling for extraordinary warmth. Genuine pebbled leather uppers. Made in Maine. Sturdy 26 oz. saltwashed cotton canvas with two roomy side pockets and interior zippered pocket. 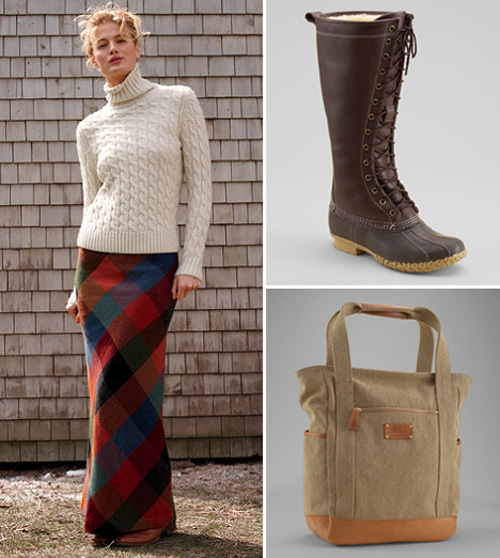 Vegetable-tanned leather trim and plaid lining. Measures 16 ½”H x 12 ½”W x 6 ½”D.